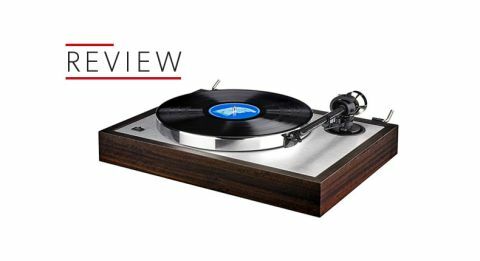 Pro-Ject The Classic review | What Hi-Fi? If you’re going to take hi-fi design inspiration from any other era, we can think of few better from which to do so than the 1960s and 70s. This is simply how many think a turntable should look. With its brushed metal top-plate submerged in a wooden plinth, and a thick-cut platter upon which to rest its purpose-built tonearm, Pro-Ject’s The Classic is, frankly, gorgeous. However, there is more to its design than to simply make ogling hi-fi enthusiasts salivate. Pro-Ject claims the turntable's two-layer design helps isolate the sub-chassis and reduce interference between different parts of the deck. Effectively, this decouples potential resonances from the already low-noise AC motor and main plinth from the turntable’s main bearing and tonearm. Isolation is provided by a series of six TPE (Thermo Plastic Elastomers) damping balls, a family of materials that can be tuned to damp resonances at specific frequencies. Pro-Ject says any TPE it uses is specifically designed for the material and frequency range it should dampen. And the suspension afforded to the upper plinth isn’t the only place you’ll find TPE. That cast aluminium main platter also benefits from such damping. There’s some adorning the counterweight, too, which itself clings to a newly designed tonearm. The tube is made from a sandwich of carbon and aluminium. As unappetising as that sounds, Pro-Ject says the former aids stiffness and speed, the latter damping. The arm’s bearing assembly aims to move with ultra-low friction, and great care is taken to ensure the tonearm lead doesn’t restrict the arm’s freedom of movement. We would, of course, always urge you to invest in adequate support for your turntable - especially if, once having added a suitable phono stage to The Classic, you’re spending upwards of a grand. Pro-Ject has tried its best to help those willing to compromise in this respect by including a trio of damped, height-adjustable feet. If there are to be any criticisms of Pro-Ject’s design, it won't concern be a lack of diligence when it comes to suspension or damping. It does mean an extra step or two when it comes to set-up. As well as fitting the belt and platter, you need to remove a few bolts from the upper plinth, apply and then set those feet to your preferred height. Though who, in reality, could protest at being asked to handle so handsome a deck? And finally, you may opt to fit your own choice of cartridge. The Classic comes fitted with an Ortofon 2M Silver moving magnet cartridge - a version of the 2M with silver coils, designed exclusively for Pro-Ject. It is also available cartridge-free and, as a consequence, the company offers counterweights upon request for cartridges up to 25g - so there’s some leeway should you decide to upgrade or fancy something different. Our review sample, however, has the 2M Silver ready-fitted, so there’s no fiddly installation required before we can flick the switch and begin playing Radiohead’s In Rainbows. The deck itself is devid of branding bar a modest logo on the dust cover, but any possible ambiguity concerning its designer will surely be dispelled as soon as anyone hears those opening processed rhythms of 15 Step, delivered with Pro-Ject’s by now familiar signature sound. You’ll struggle to find a turntable at this price with a fuller body, or one as eager as The Classic to throw a significant punch. It seemingly requires no warm-up to deliver these beats with pomp, but this enthusiasm and body doesn't come at the expense of subtlety or spoil the Pro-Ject’s ability to organise even the most testing arrangement. By the time textures have grown to full five-piece band and we’re properly into the album, we are enjoying the performance rather than just being fleetingly excited by it. That body and typical Pro-Ject warmth provide stability and an amiable glow to Thom Yorke’s vocal. It can sound thin on some of the more anaemic-sounding products we’ve tested, but it’s in no danger of doing so here. There is certainly a favourable amount of low end in the mix, and elements such as the keyed bass motif to All I Need are enough to form ripples in your teacup. But The Classic still manages to keep an even balance. It is a softer sound, overall, than that of the almost digital-sounding Clearaudio Concept - as ever, the one to beat in this sector - but it doesn’t overplay the balance in any frequency’s favour. Where ground is lost on the class leader, though, is in terms of fine detail – the kind of space and insight that, as well as the entertainment factor The Classic undeniably aces, allows for much deeper listening. We wouldn’t want Pro-Ject to dispense with its own sonic character in favour of cold analysis – you could say the character of a piece is more important than the intricate detail – but, especially when there’s a rival in the Concept that can so adeptly deliver both, we crave just a little more for the money. In reality, there’s no such thing as a hi-fi component without compromise – some simply force the listener into fewer than others. It's which, and how many, of those compromises you are willing to make. For many, the modest shortcoming in terms of detail and out-and-out precision will mean extremely little once set against The Classic’s gloriously full and warm sound. It’s perhaps not quite a modern classic. But we certainly wouldn’t tire of seeing it in our listening room.